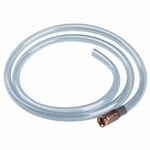 Adapter hose ( 5 foot - QCCF X DCM) to connect disposable bottle type propane appliances to bulk tank. ( 20lb or smaller). Fittings are QCCF-(Quick Connect (Acme) Female for supply) and DCM-(Disposable Cylinder Male) to attach to appliance.